As simple pleasures go, eating heaps of the freshest oysters and mussels takes some beating – particularly out at sea and even more if there are a few glasses of chilled cava involved too. 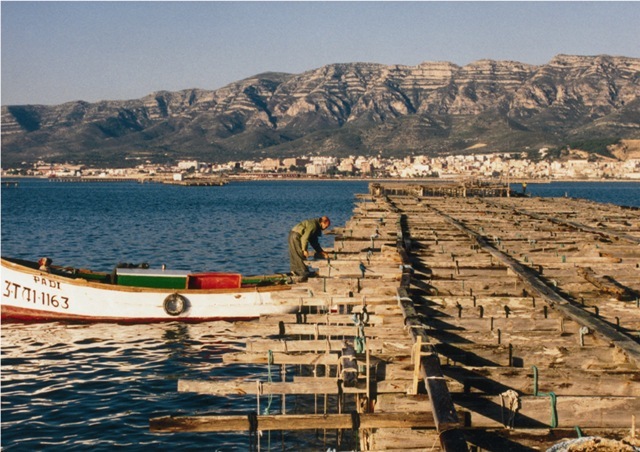 Along with about two dozen others, I had got on a boat in the harbour of Sant Carles de la Ràpita, a fishing town in the Ebro Delta nature reserve, halfway between Barcelona and Valencia, for a morning’s cruise across the bay. A wetland area where the River Ebro flows into the Mediterranean, the nature reserve is a popular base for activity holidays – particularly birdwatching, kayaking, kitesurfing and cycling. We sailed down the coast, past a string of beaches, then turned out to sea towards the Punta de la Banya, a peninsula of saltpans inhabited by flamingoes, which is linked to the mainland by a spit of golden sand. After an hour or so, the boat turned back towards the shore and approached a line of wooden platforms which stretched for about a mile across the Mediterranean. Thick ropes dangled down into the depths from the platforms, on which around a million oysters and three million mussels are grown every year. We got off the boat and climbed up the steps onto one of the platforms, where trays of oysters were laid out on trestle tables. A smiling man was deftly shucking them with a small knife. Handing one to me, he introduced himself as Agustí Bertomeu, chairman of the local union of oyster and mussel producers. “We don’t think of oysters as a luxury down here at all. We eat them all year round, and sell them for the same price as the mussels,” he said, pouring me a glass of cava, produced a bit further up the coast. Oysters may be everyday fare here on the Delta, but their quality is certainly appreciated further afield and they are exported by the truckload to France. I tried a couple. I had another swig of cava. I had a few more, and had to agree that he was quite right.